Your vehicle is made up of many different systems that work together to get you safely to where you want to be. Keyword, safely. While airbags and seatbelts are great in the event of an accident it is actually the brakes that can stop that accident from happening, assuming they are in good shape. Should you ever encounter any of the following signs of brake failure be sure to visit your local auto repair shop as soon as possible. It is up to you to keep you, your passengers and those you share the road with safe. If the brake pedal suddenly seems easier to push to the floor or rests closer to the floor than it used to you'll want to visit a repair shop right away. While this can often indicate well worn brake pads it may be a more serious issues, such as air in the brake lines or a very dangerous brake fluid leak. Your vehicle should not jerk to the left or the right when you hit the brakes. If this occurs it may indicate uneven wear of the brake pads. Other problems that can cause this include impurities in the brake fluid or a failed wheel cylinder. If you hear grinding or squealing when you apply the brakes it is imperative that you get to a repair shop. This is the number one sign of worn brake pads and the sound you are hearing is actually metal grinding on metal. When you push on the brakes there should not be any excessive vibrations. If you feel shaking in the brake pedal, steering wheel, or throughout the car there is a good chance your car is suffering from warped brake rotors. The rotors are what the brake pads rub against to create the friction that slows your car. If your vehicle has warped rotors there is a reduced surface area for the brake pads to rub against, which means it will take more distance to bring your car to a complete stop. Your car's dashboard is equipped with a number of warning lights that represent different vehicle systems. The brake system light generally reads ABS, which stands for anti-lock braking system. If this light comes on head to the repair shop for further diagnostics and repair. 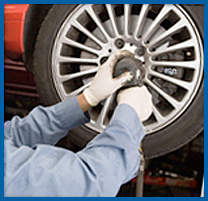 When it is time for brake repair in Covina be sure to visit the pros at Hye Tech Auto. Our full service auto repair shop will keep your car running safely and reliably. Give us a call at (626) 332-5452 to learn more about our Covina auto repair shop.